Prep @ Ranney School — Foley Prep | Train hard. Test easy. This is the third year of the Foley Prep - Ranney School partnership which has given us plenty of experience to fine-tune our approach to specifically prep Ranney students for long-term success on standardized tests. This program is a tremendous value. Last year hundreds of students spent $1200 for a similar program at Foley Prep Hubs. Ranney has been generous enough to fully support every 10th grader. By enrolling your child, you are making an excellent choice! While we will be using SAT and ACT materials in the designated classes, each class will focus on concepts and strategies that will help on both the SAT and ACT. So even if you are not sure which test your child may ultimately fare better at, go ahead and select the class that best suits his or her schedule. Students will master key concepts and Foley Prep ACT/SAT strategies in math, grammar, and some ACT science through direct instruction and reinforced through short, targeted practice sets reviewed by the instructor. Homework will be assigned, but the central focus will be engaging students in instruction and problem solving during class time. NO CLASS THURSDAY, MARCH 7th! Choose 1 section and register by February 1st using the form below. If you are not sure which test is best for your child (most people aren’t), register for the most convenient class. We will focus on concepts and strategies that will help on both exams! Please call us at 732-412-1416 if you have any questions. *March 5 is a make-up if we have a snow day or a class is otherwise canceled. *March 7 is a make up if we have a snow day or a class is otherwise canceled. This program is FREE to all students in Ranney Class of ‘21. Please note that this is an excellent opportunity - we have taken 3 years of experience and modified our program to suit Ranney students in particular. The value of this 20-hour program is $1200 at Foley Prep hubs. *Attendance policy. This is an institution-supported program, and is free of charge to Ranney Students, so long as your child attends 6 or more classes. If your child has 5 or more absences, you will be charged $600. You can make up classes by attending the other sections or at the Foley Prep Holmdel or Fair Haven Hubs. REGISTER BY FEBRUARY 1st. OPEN TO RANNEY 10th GRADERS ONLY. Because the material covered will be uniform, we will allow some movement between these sections. We kindly ask that you inform us in advance of your plan to attend a different time slot. There is no charge for this program if your child attends 6 or more classes. NOTE: After the 4th class is missed, you will be given a warning and an opportunity to make up one class at the Holmdel or Fair Haven Foley Prep office or by attending the alternating class section that fits your schedule. I accept the attendance policy. I also agree to a $600 charge if my child attends misses 5 classes. Do you have any questions, concerns, etc? Thank you - you will receive a confirmation email before the class starts. Instructors: Chris and Liam (pictured above) will be the lead instructors for this program. They've been selected from the Foley Prep faculty for their years of test prep experience and ability to engage groups of kids with very productive, motivational lessons. View their profiles on our team page. Can you prep for both the SAT and ACT? Our experience has shown that it's too early to assess which test - ACT or SAT - is better for your sophomore. So, feel free to choose a class based on whichever schedule works for you and don't worry about whether you are selecting the right test. The ACT and SAT have a great many concepts in common, thus we have geared the program so that most of what your child will learn will apply to both tests. If you have questions about the program, do not hesitate to contact Ron Foley by text or calling 732-412-1416 or via email ronfoley@foleyprep.com. 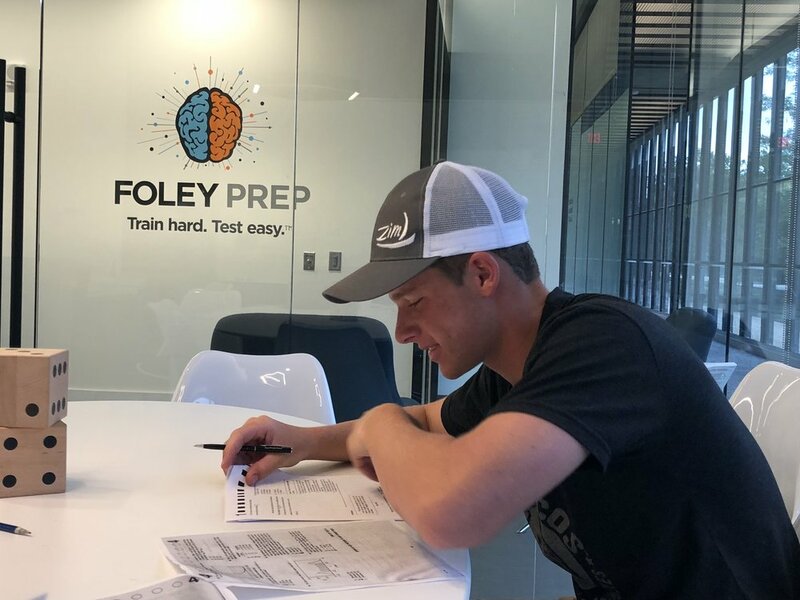 Try to take advantage of the 3 free practice tests and a free class offered at any Foley Prep Hub until June 10, 2019. Missing Classes: All classes will cover specific content and strategies that will be reinforced at various points during the course, so missing any class will not cause any major interruption in progress. Make-up classes: All participating students are welcome to sit in another section and take 1 free make-up lesson by choosing any class from the Foley Prep Schedule at our Rumson-Fair Haven or Bell Works - Holmdel Hubs. Please contact us to arrange for these make-up options. 3 Complimentary Mock ACTs or SATs: As a courtesy to our Ranney families, all students are welcome to sit for up to 3 complimentary practice tests at Foley Prep Rumson | Fair Haven or Foley Prep Holmdel - Bell anytime before June 10, 2019. Attendance Policy: Attendance is important. You will be charged $600 if your child misses 5 classes for any reason (one can be made up at a Foley Prep Hub). Otherwise there is no charge for this program.